Reader Rachel recently got a job as an assistant manager at New York & Co. 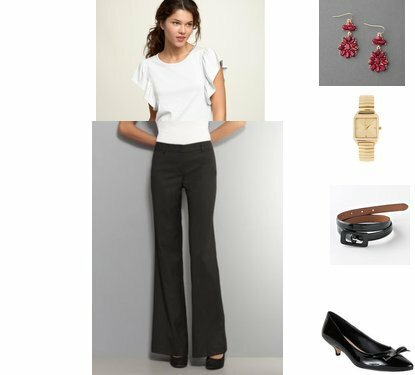 The dress code requires her to wear only black and white business casual attire, although she can incorporate pops of color in jewelry or a cami. Her shoes can be black or a neutral animal print. She's looking for outfit ideas that are stylish and comfortable enough to wear while on her feet for 8 hours a day. Although Rachel didn't specify that the clothing needed to come from New York & Co, I always think it's nice if the employees in a store are wearing at least some of the items available for purchase. So, I tried to include at least one item from NY & Co if not more in the outfits I sent her. Click on any image for more information.